Southwest bedding is a very popular design theme and can complete your bedroom décor. Southwest bedding design elements reflect the heritage of the Southwest region of the United States. You might be surprised to find that the different styles available to you for Southwest bedding cover a broad spectrum of colors and designs. You can opt for an abstract form of design that is taken from various Native American motifs, especially those found in blanket designs. Traditional Navajo designs can be found in many of the bedding styles. These are often created using browns, greens, beiges and aqua or teal colors. Burgundies and varying hues of reds are added to make an excellent contrast color and one you can use as an accent color throughout your bedroom. Many times bedding, especially comforters and decorator pillows will have contrast embellishments such as velvets, suedes, leathers, and high textures that are used as inserts or trims. 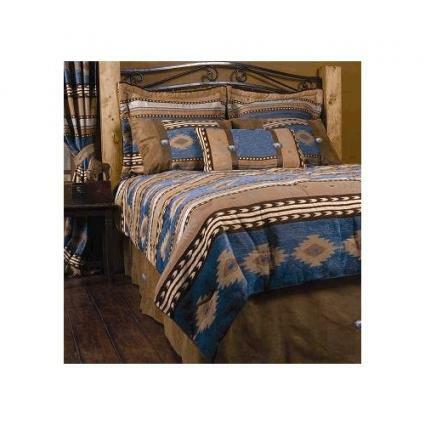 A classic western theme is often found in Southwest bedding. Popular animals used are horses, cattle or buffalo usually found in desert and sunset colors. Bear, elk and fish are used with green, blue and tan color schemes. This kind of motif makes an excellent choice for a rustic cabin or log house.You'll want to make sure your furniture is in keeping with the theme to create a unified décor to your bedroom. Geometric patterns are ancient forms found in many Aztec artifacts such as pottery, blankets and beadwork. The patterns were dramatic and vibrant and were created by intricate hand stitching. Oftentimes, the shapes were stylized or created by mixing diamond shapes and triangles in a repetitious pattern. When leather is used, it's usually attached to the fabric with a patterned stitching that becomes a part of the overall design and motif-effect. The leather texture can range from a grain to a distressed appearance and finished in a variety of natural colors. Southwest bedding color schemes are not limited to sand, tan, brown, and turquoise. There are many dynamic color combinations that incorporate greens, blues and reds as well as the expect desert colors of corals and yellows. The geometric pattern lend themselves to a variety of hues of these colors to create a very dramatic effect. You can find some very bold color combinations that are accented by the choice of motifs woven into the pattern. You can choose from traditional Southwest bedding designs or from a more stylized modern interpretation of these ancient symbols. Some bedding borrows the shapes and forms of various plant life found in the Southwest, especially cacti, yucca plants and even sagebrush. Squash blossoms and rosettes are prominent in Santa Fe inspired bedding designs as well as sunflowers.Other motifs encompass the vast history of this part of the United States. Stars are very popular symbols, especially of Texas. Star quilts are often used in Southwest bedrooms. You can't forget the cowboys of the Southwest. Ropes, boots, ten-gallon hats, and longhorns can help you recreate the feel of the old west. Hot chili peppers are also a popular motif that's associated with the Southwest decor. Shopping for Southwest bedding will provide you with a wide choice of styles and colors. When you begin shopping for your perfect Southwest bedding, you'll first need to decide on the color scheme you wish to use and the basic theme of your bedroom.